Solagratiamom: Teaching the Classics - Review & GIVEAWAY!! 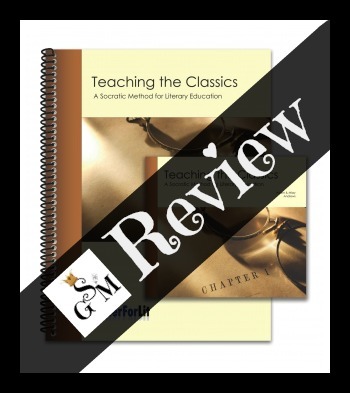 Teaching the Classics - Review & GIVEAWAY!! This course was created by Adam and Missy Andrews, a husband/wife homeschooling parent team, who were inspired to share with the parents in their community, an understanding of how to teach literature to their kids. I love to support things made by my fellow homeschooling community. Most of my favorite curriculum is by current or former homeschool parents. They uniquely know the needs and understand the best ways to approach a topic because they are in the trenches figuring this stuff out for their own children. There is no better motivator than the love of one's own children, to do some great things. I find this seminar to be one of those great things. The DVD's come with a spiral bound syllabus that follows along and provides some Appendices, that are super useful to homeschooling parents. All works of fiction share three basic elements - context, style and structure. Children's literature is the best genre for teaching these three elements. The Socratic method is the very best classroom technique for teaching literary analysis and interpretation. Some additional samples worth checking out are the Story Chart, Syllabus, and their Reading List. They have a wonderful resource called Reading Roadmaps which is the giveaway you can enter to win below. To go with their Reading Roadmaps, they have pre-selected books for reading by grade level that you can purchase as a bundle. You won't want to miss his free downloadable lectures offered on their website, like his Build the Perfect Reading List lecture. 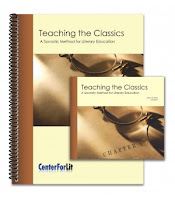 Teaching the Classics will show you how to use the five elements of fiction, and you will learn how to create story charts, as well as gain an appreciation for different literary styles. I like how they start with the big picture view of literary analysis and then break it down into it's individual elements, going into detail on each one. I truly appreciated their story chart given as an aide to us visual learners in grasping the concepts presented, and they offer a blank story chart for use in teaching the elements of any story. This DVD series will equip you to easily analyze any literary work, from alliteration in a picture book to more complex character development in Tolstoy. The real gem of this program is the full equipping it provides to parents, so they can begin to share the beauty of literature with any aged child, using the Socratic method of question and answer, as well as dialog and discussion. This tool is a must have for any homeschooling parent. You will be truly blessed to own it!